Now that the new iPad is finding its way into the hands of lucky buyers across the globe, we are beginning to hear reports of first impressions and as always, teardowns. One such teardown has come courtesy of Chipworks. As we already knew, the new iPad comes packed to the gills with technology, and that battery is as massive as we expected – you’ve got to power that 4G somehow! 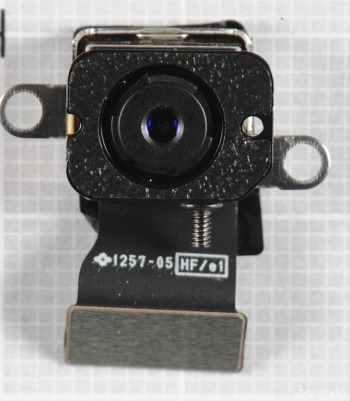 – but Chipworks has also taken a closer look at the two cameras that Apple has used this time around. Take that rear camera for example. Certainly much better than the poor camera we all had to endure in the iPad 2, the new 5-megapixel shooter is apparently the same part that Apple used in the iPhone 4. We all rated that particular camera very highly here at iDB, and it was only beaten by the even more impressive iPhone 4S camera. The news that it has been repurposed for the new iPad is certainly no disappointment. What we do find interesting though, is the video specification. Think back to the iPhone 4 and you will remember that the camera used was, and still is, capable of shooting video at 720p. What’s interesting is that same part is now capable of hitting the dizzy heights of 1080p. We can only assume the difference is the extra processing power inside the iPad. We’ve got a lot to thank that extra CPU core for, apparently. The new iPad’s front camera is also one we have seen before. In fact, it’s just been carried over from the iPad 2, and owners of the old camera-toting iPod nano have also been using the same part for a good while, too. We’re not surprised that Apple is re-using parts – it makes good business sense – but it’s interesting stuff nonetheless. Have you been taking pictures with your new iPad yet?